Israeli soldiers continued, for the fifth consecutive day, the complete closure of Azzoun town, east of the northern West Bank city of Qalqilia, and assaulted its mayor, who was trying to talk to them in an attempt to lift the siege on the town. Local activist, Hassan Shbeita, said the soldiers are preventing the Palestinians from entering or leaving the town, and are ongoing with their illegal acts of collective punishment, in addition to frequently assaulting youngsters in the town. He added that the army is claiming the siege was imposed in an attempt to prevent the youngsters from hurling stones at the soldiers, who are frequently invading their town, but the closure is just leading to further tension and confrontation. 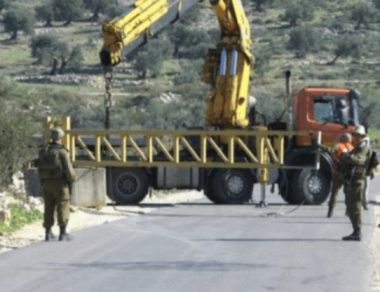 He added that the army is constantly deployed along Road #55, which leading to the town, in addition to installing a military roadblock at the western entrance of Ezbet At-Tabeeb nearby village, subjecting the residents to constant harassment and interrogation. It is worth mentioning that, on Saturday evening, the soldiers assaulted the Mayor of Azzoun, Wajdi Salim, and several members of the local council. Media sources said the soldiers fired gas bombs and concussion grenades at them when they tried to talk to them in an attempt to lift the siege, and to end these acts of collective punishment, against the town.